1,000 lbs. assembly strength and 300 lbs. working load limit. These didn't have the nice soft loops that more expensive models have ... but they've been strong, reliable and the price was right. Great tie down, good price. 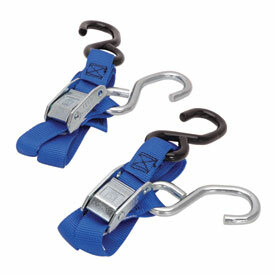 Ancra is the standard for tie down straps. Quality at a fair price. Good tie down for the price. Ratchets are better. Have been using ancra tiedowns for over 20 years. Never had a failure or problem in that time. Quality and confidence! Great tie down for the money. great quality. execllant product , extremely happy with them.